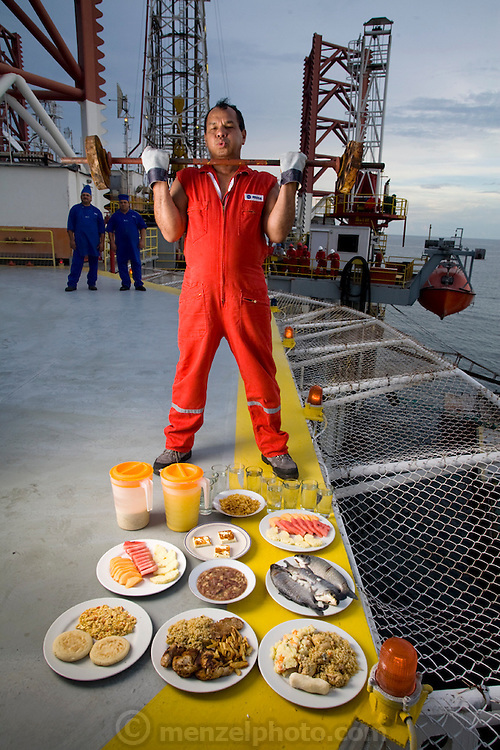 Oswaldo Gutierrez, Chief of the PDVSA Oil Platform GP 19 in Lake Maracaibo, Venezuela with his typical day's worth of food. (From the book What I Eat: Around the World in 80 Diets.) The caloric value of his day's worth of food on a day in December was 6000 kcals. He is 52; 5'7" and 220 pounds. Gutierrez works on the platform for seven days then is off at home for seven days. While on the platform he jogs on its helipad, practices karate, lifts weights, and jumps rope to keep fit. His food for the seven days comes from the platform cafeteria which, though plagued with cockroaches, turns out food choices that run from healthful to greasy-fried. Fresh squeezed orange juice is on the menu as well and Gutierrez drinks three liters of it a day himself. His diet changed about ten years ago when he decided that he'd rather be more fit than fat like many of his platform colleagues. PDVSA is the state oil company of Venezuela. MODEL RELEASED.